Our beloved Baekhyun’s 22nd birthday(6th May) is coming soon. DAZZLER is going to prepare a birthday project to celebrate his birthday! 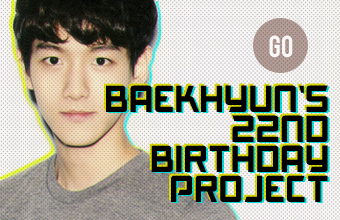 All donation which are collected will be used for Baekhyun bday project. Send your postcards to Baekhyun!! But, please make sure you wrote in English, and even better that wrote in Korean. It doesn’t matter you donated or not, we are welcome to receive your love postcard! Please join in this event! For you who want to give Baekhyun your personal gift/present, I’ll help you to deliver it to Dazzler master-nim. Then, All presents will be sent to Baekhyun by Dazzler. *All presents and letters must be arrived (korea) on April 26, 2013. Please note this! *So, all presents and letters must be arrived at coordinator place on April 18, 2013.
account number of Mandiri bank for deposit. destination address where you should deliver your present and phone number. After make a deposit, please send your prove ( picture or scan ) by mention on twitter or email. Thank You. SEMUA DONASI YANG DITERIMA AKAN DIGUNAKAN UNTUK BDAY PROJECT UNTUK BAEKHYUN. KIRIMKAN POSTCARD KALIAN UNTUK BAEKHYUN! KARENA KAMI INGIN MENGUMPULKANNYA DARI SELURUH DUNIA, MARI IKUT BERPARTISIPASI! AYO KITA BUAT BAEKHYUN TAU BAGAIMANA CINTA FANS-NYA DI INDONESIA! KALIAN TETAP BOLEH MENGIRIMKAN POSTCARD SEKALIPUN TIDAK MELAKUKAN DONASI! UNTUK KALIAN YANG INGIN MEMBERIKAN HADIAH KEPADA BAEKHYUN, AKU AKAN MEMBANTU KALIAN MENGIRIMKANNYA KE DAZZLER MASTER-NIM YANG KEMUDIAN AKAN DIKIRIM BERSAMA-SAMA DENGAN HADIAH LAINNYA KE BAEKHYUN. *SEMUA HADIAH DAN SURAT HARUS DATANG (DI KOREA) PALING LAMBAT 26 APRIL 2013. TOLONG PERHATIKAN HAL INI! NOMOR REKENING BANK MANDIRI UNTUK SETOR DONASI. SETELAH PEMBAYARAN, MOHON MENGIRIMKAN BUKTI PEMBAYARAN ( FOTO ATAU SCAN ) DENGAN MENTION KE TWITTER ATAU EMAIL. TERIMA KASIH.